A selection of four great-tasting herbal teas to suit your every mood. Pomegranate & Raspberry: A full-flavored herbal tea made with the naturally sweet and juicy flavors of pomegranate and raspberry. Night Calm: A comforting herbal tea made with soothing camomile, cooling spearmint and the subtle flavor of lemongrass. Orange & Cinnamon Spice: A warm and inviting herbal tea made with rooibos and the refreshing flavor of orange and savory cinnamon. Pure Camomile: Made from 100% pure camomile, this delicate herbal tea has a smooth taste and floral aroma. For over 300 years, Twinings has been sourcing and blending the finest, high-quality teas from around the globe to ensure that your tea has the perfect balance of tea taste, flavor and aroma. 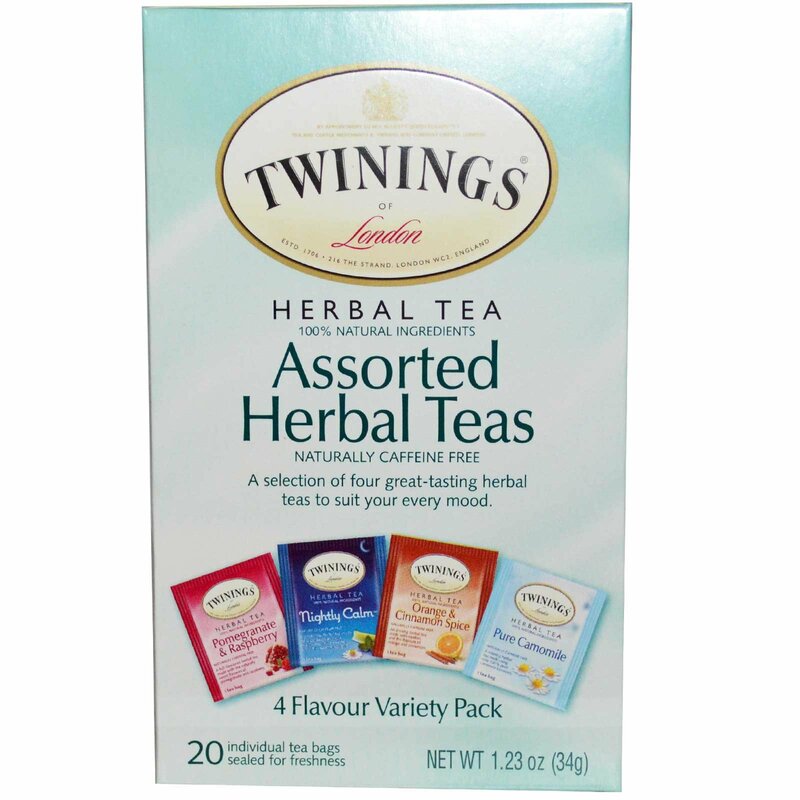 Twinings blends to perfection the finest herbs, fruits and spices to give you a line of great-tasting herbal teas with mouth-watering flavors, fresh tastes and irresistible aromas. Whatever your mood - there's a blend for every occasion. In 1706 Thomas Twining began selling fine tea from an English storefront in The Strand, London. Today, Twinings still sells some of the world's best teas from the original store and in more than 100 countries throughout the world. Hot Tea: Pour freshly boiled water over tea bag and allow to brew for 3-5 minutes depending on desired strength. Refreshing Iced Tea: To make 1 Quart of Iced Tea, use 4 tea bags and brew as suggested above using 4 cups of water. Allow to cool, then serve over ice. Pomegranate & Raspberry: rosehips, hibiscus, natural pomegranate and raspberry flavors with other natural flavors, orange leaves, apple pieces, liquorice root, roasted chicory root. 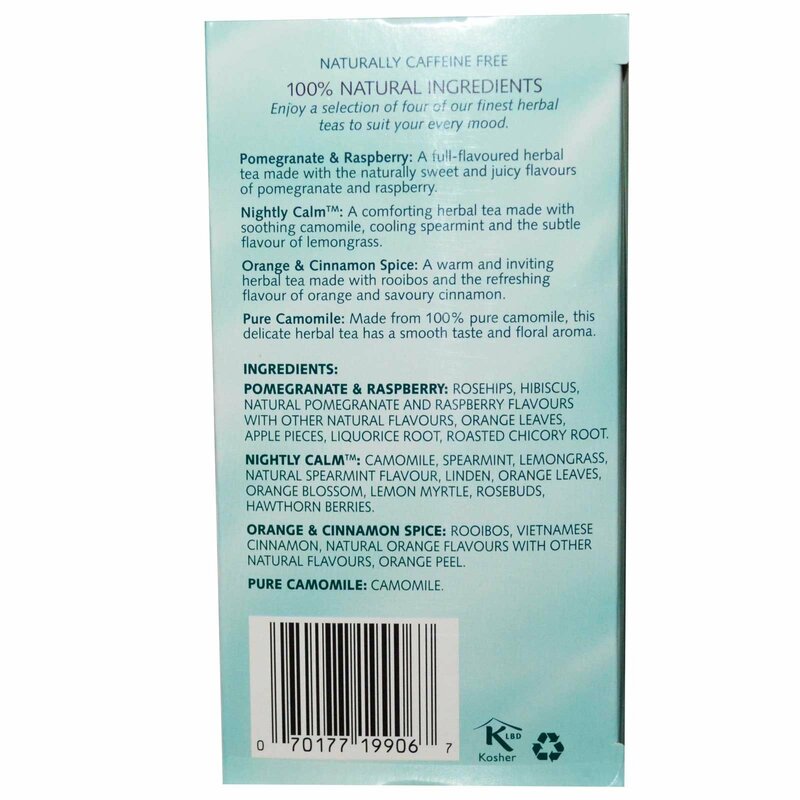 Night Calm: camomile, spearmint, lemongrass, natural spearmint flavor, linden, orange leaves, orange blossom, lemon myrtle, rosebuds, hawthorn berries. Orange & Cinnamon Spice: rooibos, vietnamese cinnamon, natural orange flavors with other natural flavors, orange peel.